If you missed the exciting Presidential election news out of Egypt this past March, don’t be too hard on yourself: also missing it were 96 million Egyptians. Yes, a few Egyptians showed up at the polls for an exercise that faintly resembled an election, but the event was lacking a few key ingredients–like actual opposition candidates. 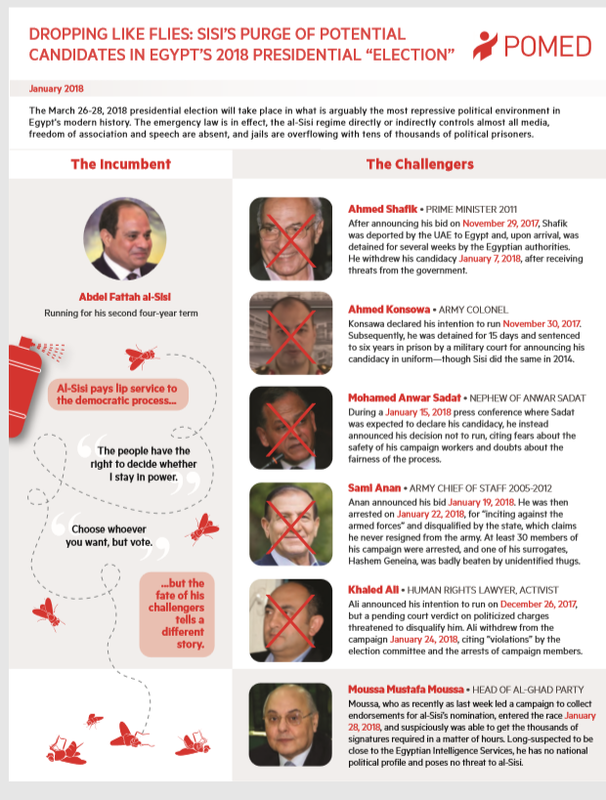 Incumbent General-turned-President Abdel Fattah al-Sisi drove five contenders out of the race by arresting or threatening them, then allowed one opposition candidate (a member of al-Sisi’s campaign staff) to register just hours before the deadline. As expected, al-Sisi claimed a “landslide” victory with a Mubarak-esque 97% of the vote. This election is one of the many things about post-Arab Spring Egypt that look remarkably like pre-Arab Spring Egypt. Egypt is again governed by a military-dominated clique that runs the state like a private investors’ club, elections are staged for international consumption, and any hint of political independence in NGOs, media or labor is ruthlessly silenced. It isn’t just opposition candidates that have been jailed: the 2018 Human Rights Watch Report notes that tens of thousands of Egyptians have been detained, arrested, tortured and disappeared since al-Sisi came to power in 2013. The only notable change from the Mubarak years is that al-Sisi no longer relies on the Communist menace to justify repression and solidify his relationship with Washington; instead, he deploys the newest smokescreen, the War on Terror, to justify mass repression. 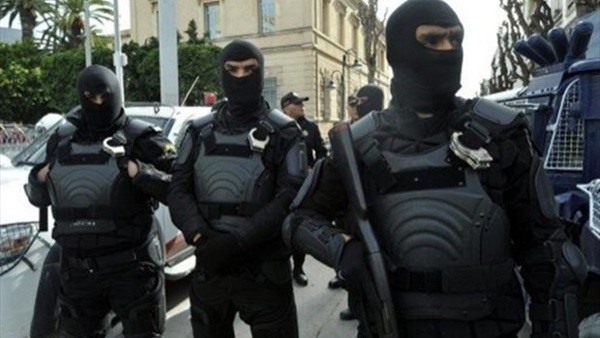 It’s the old Mubarak machine in new counterterrorism clothing. Counterterrorism may not be winning the war against terror in Egypt (in November, 310 Egyptians were killed by extremists during an armed assault on a mosque in el Arish), but it is doing a pretty good job of distracting attention from the crackdown on civil rights. For example, in February 2018 the Egyptian Army rolled out a major anti-terrorism operation in the Sinai that flooded the news with tales of troop convoys, bombing operations and weapon seizures. Of course, the media blackout meant that the news available came only from government sources, leaving open the question of who exactly was being targeted and how. Still, the images of Egyptian troops fighting extremism achieved the regime’s information goals at home and abroad. Many Egyptians, cognizant of the civil war hell that has engulfed Libya and Syria, watched the military assault on the Sinai and calculated that now was not the moment to press for freedoms of speech and assembly—even if they might be nice things to have in the month before a presidential election. The military operation also reminded the U.S. of Egypt’s partnership in the War on Terror, silencing some congressional critics of al-Sisi who had been debating tying part of the $1.6 billion U.S. aid package to political reform. 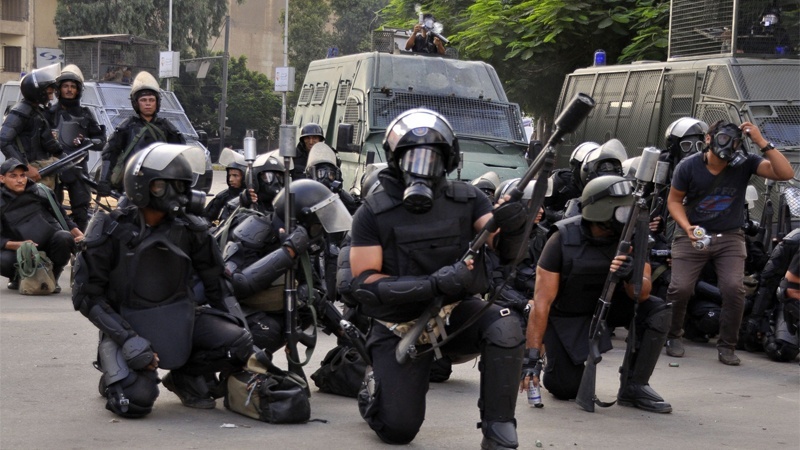 U.S. military aid has helped Egypt equip counterterrorism units that are also used to break up strikes and protests. The real war for Egypt isn’t going to be waged in the Sinai, however. It will be waged in the textile mills, railroad yards and teacher’s lounges across the nation. Egyptian unions led the nation into the Arab Spring by creating a space for public protest in the years before 2011, and they are the only civil society sector challenging the government today. 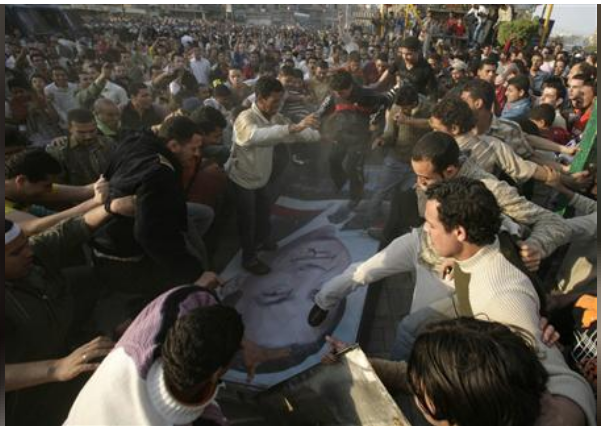 In 2008 videos of workers defacing a poster of then-President Mubarak shocked the nation. While the tech-savvy youth of Cairo captured the world’s imagination in the Arab Spring of 2011, it was actually the Egyptian labor movement that ousted the thirty-year regime of Hosni Mubarak in 2011. Between 2004 and 2010 there were more than 4000 unauthorized strikes across Egypt. Working conditions were abysmal and worsening. The official monthly wage was $6 a month (34 Egyptian pounds, set in 1984), and the majority of the population subsisted on less than $1 a day. Some workers earned more ($45–$117 a month), but living conditions were increasingly unstable as the government scrambled to attract foreign investment and loans in the wild west of neoliberal capitalism. Temporary contracts ended traditional labor protections, and the state backed off from commitments to subsidies on basic consumption items. 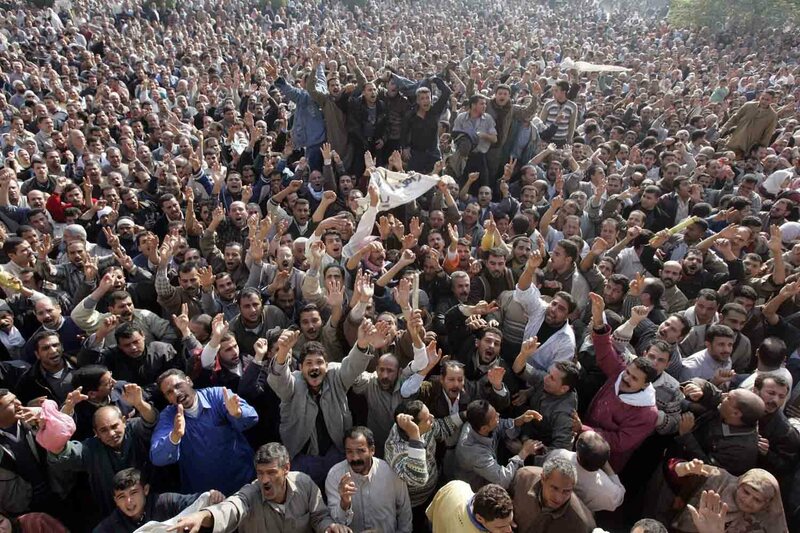 Striking Workers at el Mahalla, 2006. The strikes that undid Mubarak’s Egypt centered on the textile industry in el Mahalla al Kubra. More than 20,000 workers shut down production multiple times and, while the demands were focused on workplace issues (wage increases, benefits, work protections and the right to establish unions independent from state control), the day-to-day cooperation required to manage community life during strikes inevitably politicized discussions. Since the 1950s the Egyptian state had controlled the syndicates that organized everyone from lawyers to street sweepers, trading benefits for political support. But by the 2000s the state had abandoned the compact, and replaced bargaining with violent repression. In 2008 strikers in Mahalla moved from an attitude of petitioning to confronting the state. It was the labor movement that laid the groundwork for the Arab Spring in Egypt, and despite harsh repression since 2013, unions remain the most active civil society sector challenging the regime. The strikes in Mahalla were largely invisible to most Egyptians due to state media controls, but in April 2008 phone videos showing strikers defacing a poster of President Mubarak went viral, stunning the government (which quickly negotiated a resolution to the strike) and fascinating the few Egyptians with access to social media. The unplanned act foreshadowed a new era of Egyptian politics. Three years later urban youth received the credit for expelling Mubarak, but it was the unions—lawyers, teachers, transportation workers, textile workers, etc.—who led the way. Unfortunately, workers found that little changed after 2011. 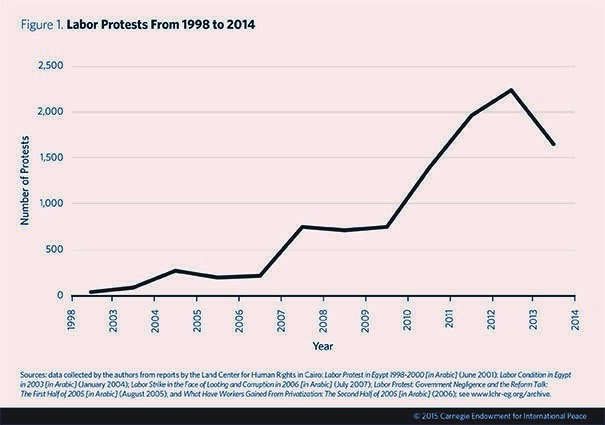 Each administration since 2011 has waged a campaign of harassment against labor leaders, criminalizing protests, strikes and independent unions. Repressive laws designed to combat terrorist militias have been used against labor; unlucky activists have been detained in the middle of the night and held for years without charges or tried in military courts for destabilizing the nation. Egyptian Special Forces raid in central Cairo, Sept. 2017. Hundreds of Egyptians have disappeared since 2013, but in 2016 the kidnapping and murder of Giulio Regeni, an Italian graduate student studying unions in Cairo, created an international scandal that exposed the brutality of the regime. The signs of torture on his body, consistent with Egyptian security practices, sent a chilling message to international journalists, academics and human rights activists who might once have expected their passport to protect them: in Egypt, no one is safe from the state. The labor crisis in Egypt isn’t a remote struggle showcasing the horrors of distant countries. It raises the same issues that increasingly confront workers everywhere: how do vulnerable groups achieve a life with dignity in an era when states are abandoning commitments to the public good in favor of serving elites? When capital can travel easily across borders to seek out the weakest regulatory markets? There isn’t really any road back from globalization—changes in technology and production chains have made that impossible—but we can resurrect an alternative vision of globalization that recognizes the shared concerns we all have with addressing economic and political rights. The U.S. government, blinded by its fixation on Islamist radicals, has given the Egyptian government a free hand to abuse state power, using weapons paid for with American taxpayer money. At a minimum, the U.S. could condemn the harassment of journalists, the midnight detention of human rights activists, the criminalization of strikes and protests, or even the sham of an election that just passed. Egypt today is more violently repressive than it was during the Mubarak years, but workers continue to challenge a state that is more interested in capturing the approval and investments of international capital than in serving the public they purport to represent. Egyptian labor deserves our attention and support. This entry was posted in Arab Spring, Egypt, labor. Bookmark the permalink.